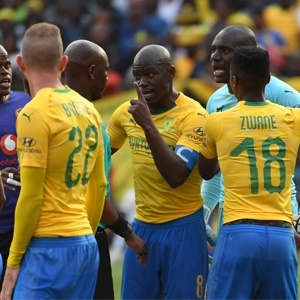 Cape Town - Mamelodi Sundowns destroyer Hlompho Kekana believes Monday's clash against Orlando Pirates will be won by the side with greater hunger and commitment. Sundowns are set to take on the Sea Robbers at the Orlando Stadium in what could potentially be a title-decider. The Brazilians have a three-point advantage at the top of the Premiership standings over Bucs in third place highlighting just how important the game is to both teams. Speaking to reporters, Kekana said: "There is more to this game than just the three points on offer and we will have to give a good account of ourselves to be able to get a favourable result. "We know what is ahead of us, this is a football match between Orlando Pirates and Mamelodi Sundowns. "We know that we are going to the backyard of a powerhouse of South African football, but we are going there to give it our all. "It is important to go there and try to get all the three points on offer to boost our case on the log standings. "To be able to win this match, we will have to stick to our processes and be disciplined in our approach. "I know that it's not going to be easy because just like us they are chasing the league title. "But we will have to dig deep in front of what is expected to be a hostile crowd." Pirates stars Xola Mlambo and Vincent Pule are ruled out of the clash though the 33-year-old does not think this makes Bucs any less dangerous. He concluded: "It would be completely naive of us to think that they are going to be weak or easy because Pule is definitely out and Mlambo may also not be available. "I am sure that those who are going to replace them will be able to carry the team and they will be motivated to impress the fans and the coach. "In high-profile matches like these, it is about who wants it more and we must be motivated enough to deal with whatever they are going to throw at us." Kick-off is at 19:30 in Johannesburg.